We have 3 international distributors which are Korea, Taiwan, and Singapore. If you are planning to sell BITATTO in those countries, please contact them. 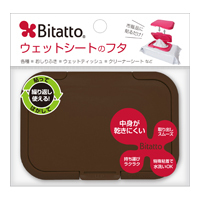 Regular size of Bitatto is able to be used for all types of wet wipes. Width 12cm size allows use with small to big size wet wipes. Cute and simple design in 6 colors are on sale. ※ Adhesive processing, packaging, and inspection processes are done in Japan. Bitatto Plus’s new clear colors have been released! Bitatto has been very very popular since it released. Easyto open by one hand and one push. 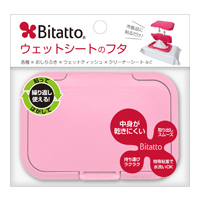 Bitatto plus is added function of easy to use from wet sheet lid’s Bitatto. Following up “Drink by myself”. Cheer up child’s motivation. Putting it to Pet bottle or Baby bottle, it changes handle type! 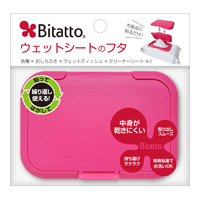 Convenient to carry！Mini size of Bitatto is convenient to be used for portable wet wipes. It does not take up much space. Easy to use! Hygienic! Eco-friendly! Bitatto solves drying out problem when you use wet wipes. POP and Candy color Bitatto POP joins to Bitatto series. Bitatto Plus finally releases with upgraded functionality and quality! Push with a finger to open! It is also closed tightly by one hand with no effort. The upgraded special adhesion not only stronger to use durable but same function as washable! Lovely ribbon design is released to catch the customers’ attention! Unique design but same functions! Bitatto Coo is newly released with new design. It just looks like a bird spreading wings when you open up the lid. We have provided them with heart and soul in each product. Easy to use! Hygienic! Eco-friendly! Bitatto solves drying out problem when you use wet wipes.New series [The Very Hungry Caterpillar] which is very popular with girls is joined! Easy to use! Hygienic! Eco-friendly! Bitatto solves drying out problem when you use wet wipes.New series [Gaspard et Lisa ]which is joined! Easy to use! Hygienic! Eco-friendly! Bitatto solves drying out problem when you use wet wipes.New series [The Bear’s school] which is very popular with girls is joined! Bitatto Shade new friend of Bitatto series which concept is easy to attach and detach.In car or even in house, whenever and where you want, you can paste it to glass.As soon as pasting it, kids start smiling. No need of special Mug. Only covering to a cup. The cup becomes straw mug. Bitatto mug is a perfect item for verywhere!